Have you ever wondered why government employees seem to retire at such a young age? Well, the reason is that government retirement systems often have retirement eligibility rules allowing people to do so. It is such an important benefit that many government workers do not seek employment outside the public sector or even outside organizations within their own retirement systems. Government retirement systems base retirement eligibility on two factors: age and years of service. For almost every government retirement system there is some number that represents the sum of an employee's age and years of service that once reached makes an employee eligible to retire. Many systems use the rule of 80. It means that once an employee's age and years of service total 80, the employee is eligible to retire. Here is an example. An employee begins working for a government agency at age 27. The organization’s retirement system operates under the rule of 80. Given this employee’s age and the rule of 80, the employee will be eligible to retire at age 53 1/2 after 26 1/2 years of service. This early retirement age gives the employee plenty of working years left to pursue a second career or come back to public service to double dip. Double dipping is when an employee has retired and is drawing an annuity but is also working and earning a salary in an organization that participates in the same retirement system. Retirement systems often have provisions for those who start in public service very late in their careers. Systems may adopt a retirement age where people can retire even if they have not reached the rule of 80. Many systems allow employees age 65 to retire regardless of their years of service. These individuals receive small annuities because of their few years in the system, and they may not have the same health care benefits as those who reach the rule of 80 before retiring. To increase the number of employees contributing to the system and to reduce the number of retirees drawing from it, some retirement systems have increased from the rule of 80 to the rule of 85 or even 90. When this happens, existing employees are often grandfathered into the old rules, and new employees must meet the new requirements. Grandfathering makes retirement system changes more palatable to existing employees. Employees feel undercut, devalued and cheated when retirement system rules change on them. Future employees have no say in the matter because no one knows who they are yet. While grandfathering makes the sales pitch easier, it creates administrative burdens. Retirement systems must maintain two or more sets of rules, forms, help documents and the like. The increased maintenance costs continue in perpetuity until retirees under an old set of rules die out. Say the 27-year-old employee in the earlier example is in a retirement system that operates with the rule of 90 instead of the rule of 80. Because of this one change, this employee will be eligible for retirement at age 58 1/2 with 31 1/2 years of service. Retirement systems tend to have strict rules about transferring service credit from one retirement system to another. When employees move between jobs under different retirement systems, they may lose service credit. Government employees should investigate this possibility when considering a new job. When service credit does not transfer, employees may have the option to leave what they have in the old retirement system there and start fresh in the new system. An employee could wind up with different retirement dates among two or more systems. 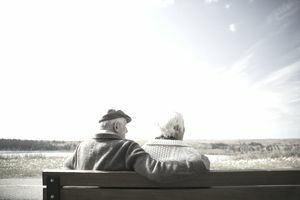 Then, the retirement dates are merely dates when an employee may access financial benefits, but employees could choose to begin accessing all their annuities at the same time. What Does a Disability Determination Specialist Do?